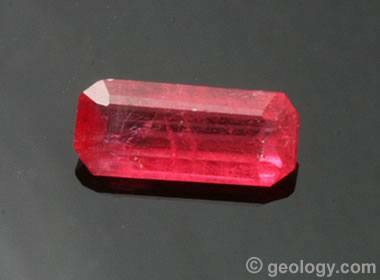 A pink to red manganese silicate used as a gemstone and minor ore of manganese. Rhodonite from Nevada: Rhodonite with its characteristic matrix and fracture-filling of manganese oxide. This specimen from Humboldt County, Nevada was photographed by Chris Ralph of Nevada-Outback-Gems.com and is used here as a public domain image. Rhodonite is a pink manganese silicate mineral of variable composition that often contains significant amounts of iron, magnesium, and calcium. It has a generalized chemical composition of (Mn,Fe,Mg,Ca)SiO3. Rhodonite is often associated with black manganese oxides which may occur as dendrites, fracture-fillings, or matrix within the specimen. Other names for rhodonite include "manganese spar" and "manganolite." 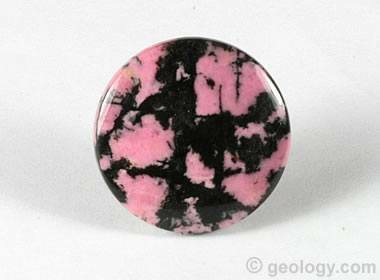 Rhodonite cabochon: A cabochon cut from pink rhodonite in a matrix of black manganese oxide. The pink color of this specimen is especially nice, and the manganese oxide is typical. This cabochon is about 28 millimeters in diameter. Rhodonite is usually found in metamorphic rocks associated with other manganese minerals. It is also found in rocks that have been altered by contact metamorphism, hydrothermal and metasomatic processes. It is usually massive to granular in occurrence. 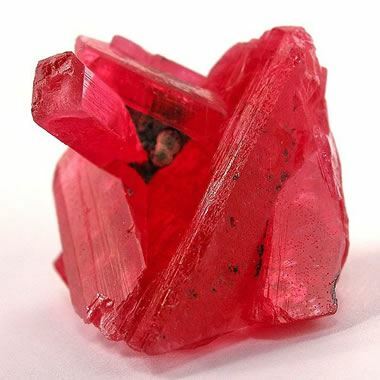 Rarely, it is found as red triclinic crystals. Rhodonite is an uncommon mineral. It is found in a few small deposits across the world. Sources of rhodonite include: Argentina, Australia, Brazil, Canada, England, India, Peru, Russia, and Sweden. In the United States it has been found in North Carolina, Colorado, New Jersey, and has been named as the state gem of Massachusetts. Rhodonite's diagnostic properties are its pink to red color, hardness, high specific gravity, perfect cleavage, and its close association with black manganese oxides. It is sometimes confused with rhodochrosite, which is softer and effervescent in hydrochloric acid, or thulite, which is usually not associated with black manganese oxides. The physical properties of rhodonite are summarized in the table on this page. Faceted rhodonite: Rhodonite is rarely seen as a faceted stone. Excellent crystals of rhodonite are very rare and usually sell for such high prices to mineral collectors that very few are faceted. Occasionally, broken or second-quality crystals are faceted. Because of their cleavage and low hardness, faceted specimens of rhodonite are more in demand as "collector gems" than for use in jewelry. 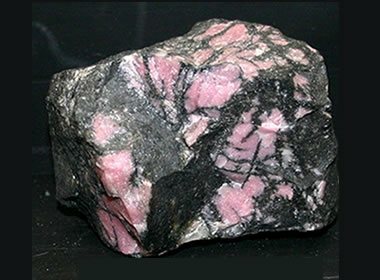 Rhodonite was once used as ore of manganese in India. Today its only uses are as lapidary materials and as mineral specimens. High-quality crystals of rhodonite can sell for very high prices. Good massive pink- to red-colored material is used as an ornamental stone or gem rough. It is typically used to make cabochons, beads, small sculptures, tumbled stones, and other lapidary projects. 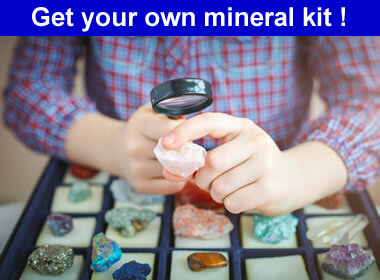 Rare, well-formed, transparent crystals are highly sought after by mineral collectors. Damaged crystals of good quality are sometimes cut into faceted stones. Most of these are acquired by collectors because their cleavage and low hardness make them too fragile for use in jewelry. Rhodonite crystals: A nice cluster of rhodonite crystals from Minas Gerais, Brazil. Specimen is about 2.5 centimeters in height. Specimen and photo by Arkenstone / www.iRocks.com. 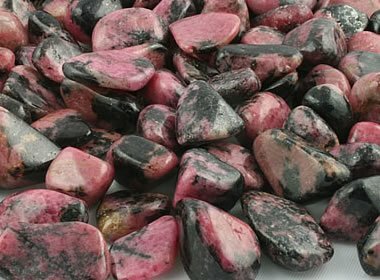 Tumbled rhodonite: Rhodonite is sometimes used to make tumbled stones in a rock tumbler. Many people enjoy the raspberry color of rhodonite against the black manganese oxide. Rhodonite is a good tumbling rough for experienced tumblers. The material most often offered as a tumbling rough is inexpensive and with significant amounts of black manganese oxide. It can be challenging to polish because the manganese oxide often has a hardness that is different from the rhodonite. This results in overcutting of one material and undercutting of the other. Specimens of rhodonite that contain up to 20% calcium oxide are usually grayish brown in color and are known as "bustamite." "Fowlerite" is the name given to specimens that contain up to 7% zinc oxide. Specimens with a brown color have usually been altered by weathering. Rhodonite is one of two minerals with a chemical composition of manganese silicate. The other is a high-temperature, low-pressure polymorph known as "pyroxmangite."